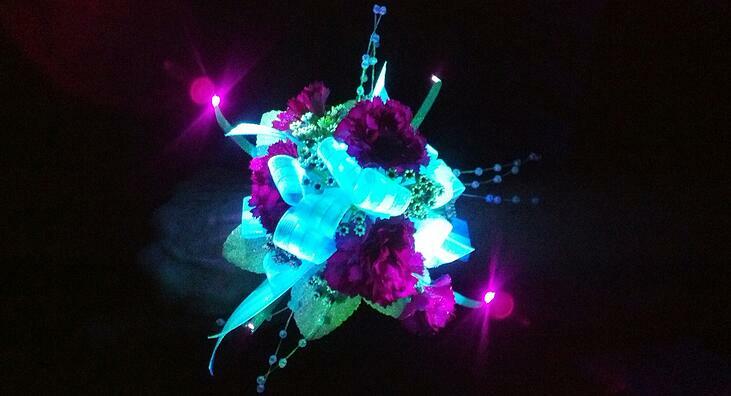 We keep tabs on the latest and greatest ideas with prom flowers and we've noticed a consistent trend...ANYTHING goes! 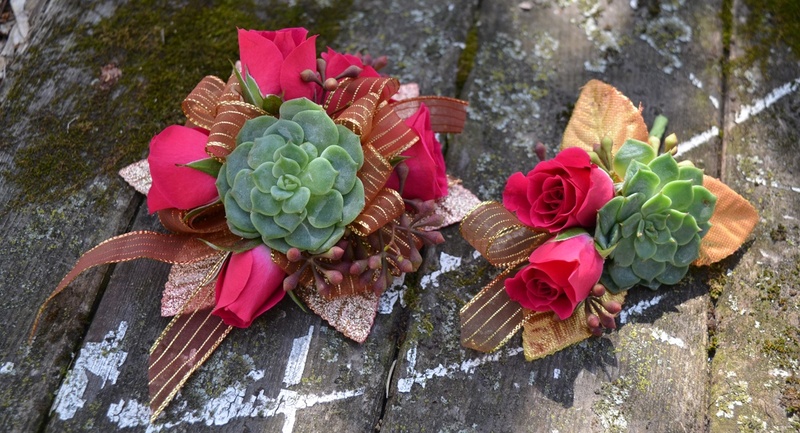 For real, there aren't set-in-stone guidelines for the ultimate prom corsage and/or boutonniere. Know why? Just like every wedding dress, every prom ensemble is different. Prom flowers reflect your personal style through complementing the outfit. Now that we've come to terms with the rules of prom flower styling (there aren't any) here are some things to consider when choosing your prom flowers. 1. Clothing: What are You Wearing? Dress? Suit and Tie? Oversized T-Shirt and Leggings? The style of the outfit will help you decide whether you're getting a wrist corsage (most popular), hand held (senior prom), special placement (wraparound, ring, shoe, hair, etc) or boutonniere. If you're buying prom flowers for your date and unsure of the best option, a wrist corsage is the most popular for dresses. Another option is bring your date with you to the florist. Pick out flowers and color options together can be fun. Just think of it as a mini-date for the big day! Not ready to come in just yet? Visit our prom collection online to get ideas before visiting our store to find the perfect prom flower match for your style! 2. Colors: Choose Your Colors. Outfit style. Check. Onto matching colors of the outfit to the corsage and boutonniere! We have an awesome prom accessory setup for matching outfit colors. Our staff can guide you through all the ribbons, rhinestone and bead accents, bracelets, etc for your color combination. Is it absolutely necessary to match the color of the outfit? As mentioned in the beginning, anything goes. Match the dress, find complimentary colors or go neutral! Neutral colors such as pale peach, cream and beige look great with everything and often lend to a softer, vintage vibe. Regardless of the color direction you're going, it is highly suggested to bring in the outfit for best matching purposes. If it's not possible to bring in the prom ensemble that's ok! Take a picture of the outfit in good lighting and bring it in. We can take it from there! 3. Cost: Know your budget. What do prom flowers cost? Corsage pricing begins at $18.95 and our boutonnieres start at $5.95. There are a wide variety of flowers and colors to choose from. Keep costs down with selecting flowers such as carnations, daisies, alstroemeria or do a combination of those flowers with sweetheart roses! More expensive corsages will use sweetheart roses, orchids, upgrades on standard wristlets, boutonniere holders and specialty corsages. Visit our prom collection online for more ideas on pricing, flowers and upgrades you can make to your corsages including making them glow! Thanks to Galassia Fluorescence method, we can take our signature corsages and turn it into glowing crown of glory for your prom ensemble. Learn more about Galassia Fluorescence! It's amazing what you can do with a variety of flowers! 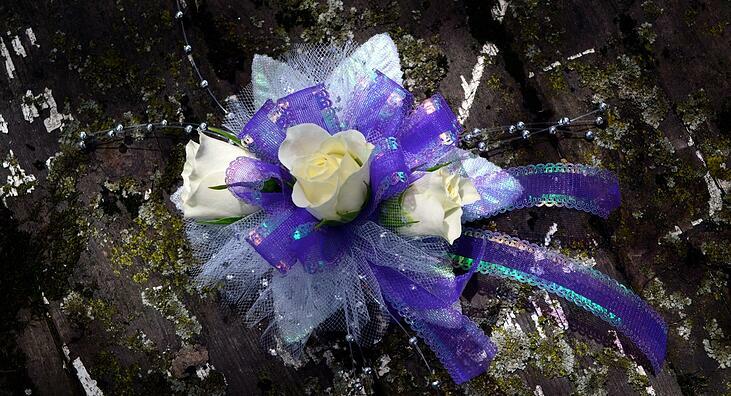 Tight budget or skies the limit, we can make the perfect prom corsage for prom night on any budget! 4. Call: Call, Come In and Order from Us! We've covered the outfit, colors and cost. All that is left to do is call, come in and order from Gillespie Florists! Our extensive online prom collection can help inspire you with flowers, style, ideas etc. Any questions? Don't hesitate to call or visit us and speak with our experienced staff on how to get the ball rolling on flowers for prom night! We have everything you need in prom flowers to complete your final look and make prom a fantastic night to remember. Della and Robyn walk us through the Prom Kit Prep in this Video!